Mmmmmm…. having my taste buds confused has never felt so delicious! 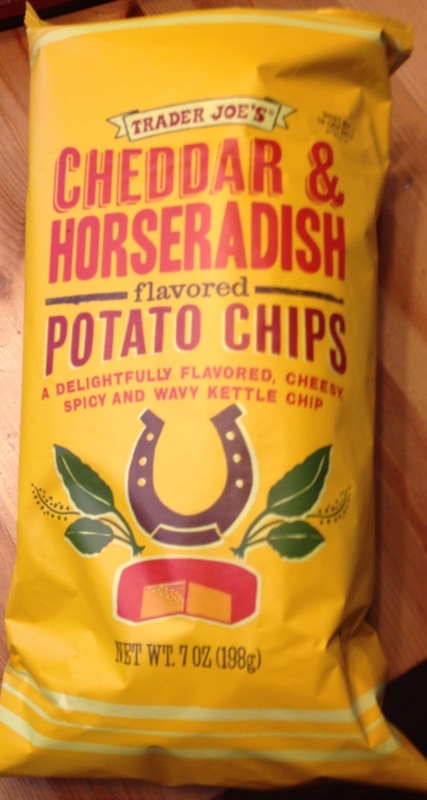 Pax Vobiscum* lords and ladies, it’s Funny Names in the News Volume 74, where I take a break from these oddly edible Cheddar & Horseradish flavored chips and hit y’all with the funniest and most newsworthy names in the news of this past fortnight! We’ll start you off with one newfangled fandango of a name. I Swear He Does Productive Things With His Life In Addition to Finding Amazing Regional Newspaper Fare correspondent Arto heard through the grapevine that a fine-feathered fellow named Hubert Opici is “New Jersey’s American Wine Legend.” But don’t just take my word for it… check it out for yourself thanks to this delightful NJ.com article. Our faithful Yippy Skippy Zippy correspondent Amb! brings us a piece of sad news that is simply ghastly: famed screenwriter Harold Ramis has passed away. But frankly, she put it better herself, saying that Harold Ramis – he was Egon Spengler in Ghostbusters! He wrote Ghostbusters! 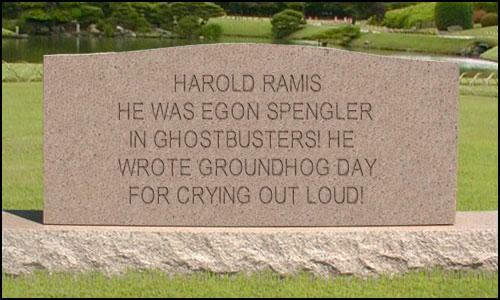 He wrote Groundhog Day, for crying out loud – passed away. I hope someday to be described so awesomely, and I hope Amb’s description of him goes on his tombstone. That’s better! Thanks JJ Chandler for your inspired Tombstone Generator page, even if I couldn’t quite fit all of Amb’s text onto it. We need more web developers like you! The good news is there’s at least one other web developer who is equally awesome! Someone with a love for the Oscars and funny names – and who stunningly isn’t Amb or Arto – took a time from his or her usual workflow to delve into the philanthropic pursuit of creating a John Travolta-inspired name generator. In case you missed it, Johnny-boy was supposed to read Idina Menzel‘s name, but instead called her Adele Dazeem at last weekend’s Oscars – an event that pleased no one except the funny names bloggers who now get two funny sounding names instead of one. Amber, my darling, I know you get mad when I repost your material verbatim, but after a 10-hour tutoring day, it’s hard for me to outdo your sprightly and clever way of describing…well… anything! P.S. Arto wants us to note that he used the name generator and his Travoltized name is Amber Jerkson. What the what?!? Is there something in the aether? 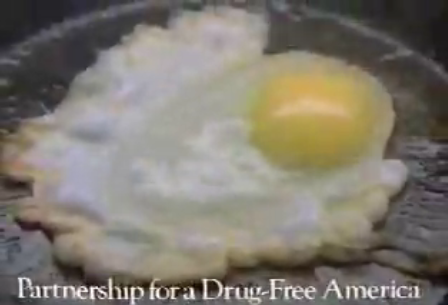 Is there someone on ether? Seriously, my mind is blown. And not just because I’m apparently now known as Daud Crawzford. Closing out this week’s awesome FNITN fare are two names that are truly Zane-y and Truffle-y. Americanized Football Correspondent Arto informs us that Zane Beadles does indeed exist. And yours truly, Zany Truffley correspondent Dave, provides a heartfelt reminder that Truffles Weethee demands more respect in an incredibly thoughtful and honest Bill Kristof article in the New York Times. Thanks for joining us folks, this has been another edition of Funny Names in The News. Enjoy your Friday and don’t overconsume horseradish! *P.S. Pax Vobiscum is Latin for “Peace Be With You”! P.P.S. For those of you who don’t know, I got accepted to TWO top medical schools last week – University of Central Florida and Case Western Reserve University! Woohoo! Now I won’t be a bum and I can finally become a contender! This entry was posted in Funny Names In The News, Uncategorized and tagged entertainment, humor, humour, movies, names, news, writing. Bookmark the permalink. I don’t feel too bad about not doing the blurbs, since you’re the one who sent the blurb generator into catastrophic hyperdrive. But anyway, a monster FNitN! John Travolta said Diddy was “Damon”! He must have seen my movie The Bourne Idendiddy! This made me smile in a way that will make me live an extra three days at the end of my life. Thank you for that. That’s three good rounds of golf! Forgot the most important thing, that I had honestly planned to mention first. What kind of doctor are you going to be when you grow up? You will have all kinds of Latin words to learn, right? Perhaps you can be the doctor that lobs off all the lymphoma chunks on the stout legs of people on TLC’s “My 600 lb Life.” Just a suggestion. I took that Travolta quiz on fb and became a Sofia, so thank you, Danny Zuko, for that. I think it’s just a lifetime of Scientology-Induced Dementia that caused the name confusion. Perhaps you can research that in your new school, although you won’t be near L.A…. I say 50 is grown up. OK, I’ve got some time then! But right now I’m leaning toward neuropsychiatry, but with the caveat that I will be exposed to a lot of new disciplines in the coming years, so my mind could change entirely. That is one fine tombstone. Mmmhmmm. I think I want to be Truffles Weethee. Did you read the article? Her life doesn’t seem all that grand. But the name Truffles is certainly an amazing one! I appreciate Truffles speaking out. First of all, Congratulations Dave, well done. Secondly, even as sleep deprived are you are, great job on the FNitN. Your poll made me laugh out loud. It’s kismet, obviously. The pocket-sized, adorable brunette kind. congrats and now you can start writing about diseases and patients with funny names. this will open up a whole new avenue for you! Yay! So excited about that! Unfortunately there’s that pesky confidentiality thing, but nonetheless I’m sure I”ll find something! If you suffer from regular breakouts, you should increase how many times you cleanse your face each day.